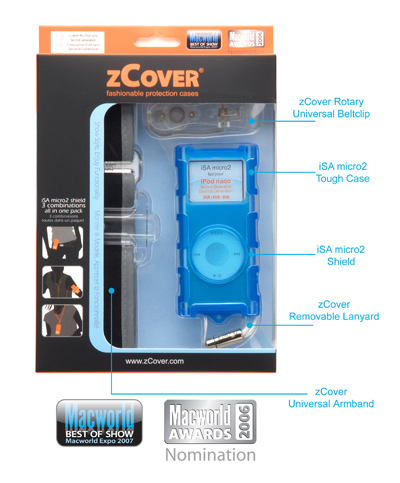 zCover Inc, the leading manufacturer of fashionable silicone protective cases has announced today the release of their iSA micro2 Shield Three (3) Combination All-in-One Pack for Apple iPod nano 2nd Generation. zCover leads the way in manufacturing a high quality product that is always ready for the ever changing market of technology. Each zCover iSA micro2 Shield Three Combination All-in-One Pack retail pack or online pouch pack contains five components: zCover iSA micro2 Tough case, hard crystal clear shield, universal armband, rotary belt clip, and lanyard. Our full line of iSA micro2 series cases boast of a state of the art. They provide 98% surface coverage to iPod nan2. This iSA micro2 Tough silicone case was crafted from non-toxic, durable high-grade silicone rubber. 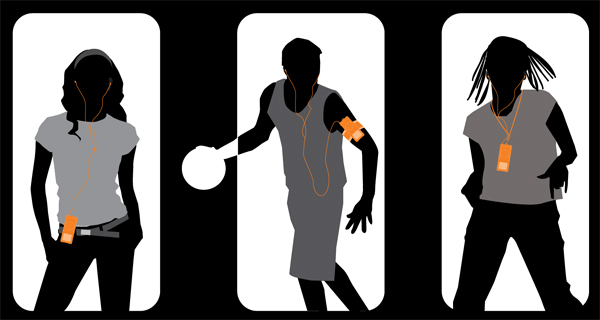 Side-reinforcement-block gives your iPod nano a stylish look and a better protection. Integrated 0.6mm ultra thin protective skin protects entirely Click Wheel from dust, dirt, moisture, and liquids. Customized Hard crystal clear screen protector and face shield highlights and shines your iPod, it provides the best vision effect, perfect fit, and prevents scratching and dirt to your screen. There versatile and interchangeable in pack accessories, universal armband, universal rotary belt clip, and removable lanyard are the high point of this iSA micro2 Shield Three (3) Combination All-in-One Pack. Universal armband set use a Velcro strap of striking adjustability and reliability, which allows a perimeter range from 6'' to 18'' and holds the device securely in place. It's moisture-resistant and washable, so you don't have to worry that exposure to sweat and dirt will spoil even ruin the product. Two reflective rims offer safe feature for outdoor exercisers. zCover universal armband set 360° rotary gear allows you to turn the screen to whatever angle you like while iPod on your arm. Universal Rotary Belt Clip makes your iPod nano can be rotated and locked at 8 position in 360Â° to meet your pose, so that you can wear your iPod vertically or horizontally when clipped to your belt. zCover Clip comes with a soft landing insert locker disk, which provides a better grip and will not scratch or melt on your iPod nano. zCover low profile Universal Rotary Belt Clip can be completely removed, making it easier to put the zCovered iPod nano into your pocket or handbag while retaining the slim appearance of iPod nano. At zCover, we are always striving to make the best possible product. Combine zCover's advanced moulding technology with our industrial know-how and you will be impressed by all of our zCover iSA micro2 series cases are dockable and adaptable with the case on, it also compatible with zCover Window Clip set, the Best of Show winner of MacWorld San Francisco 2007.
zCover iSA micro 2 Shield comes in your choice of four fun and bright colors, Black, Blue, Pink, and ice-Clear. Each zCover iSA micro2 Shield Three Combination All-in-One Pack (retail packaging or on-line-order packaging) for Apple iPod nano 2nd Generation bundled with five (5) components: zCover iSA micro2 Tough case, hard crystal clear PC shield, universal armband, rotary belt clip, and lanyard.